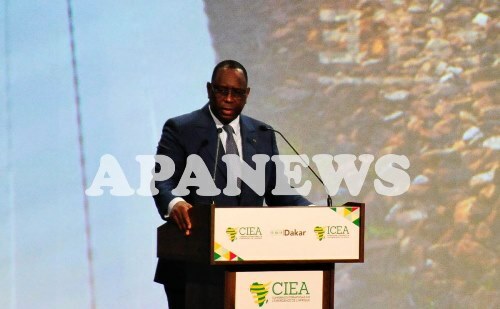 While keeping in mind the past, Africa is determined to look into the future and move forward to enter the era of emergence and development, the Senegalese head of state Macky Sall said Thursday at a conference in Diamniadio on the outskirts of Dakar. “More than any other continent, Africa has suffered the most the crushing weight in history. Despite this disabling burden, we are resolute while keeping in mind the past, to look ahead and move forward,” said President Sall, who presided at the opening ceremony of the third edition of the International Conference on Africa’s Emergence (CIEA-III). "We bear in mind that development cannot be achieved with international aid, and that emergence is not declared, but is conquered by a vision and actions," Sall went on, adding that it is built on the efforts of African countries first, but also on the vitality of balanced partnerships that respect the interests of all parties. Concerning the efforts required, Sall called for more taxation fairness, including fighting for the fair payment of tax by all taxpayers and the limitation of the abusive tax fraud. "Tax must be paid where the activity creates wealth and profit," he said, pointing out that Africa loses between $40 billion and $80 billion in unpaid taxes each year, according to estimates of the Independent Commission for the Reform of International Corporation Tax. "We ought to put an end to undue tax holiday. If the taxes due to Africa were paid, the debate on official development aid would not arise," he continued, calling again to act firmly against tax evasion and illegal financial flows. President Sall called for an overhaul of the international tax system, which he believes should include three key priorities: technical assistance in identifying reform needs and strategic planning; tax administrations, including support for the de-materialization of procedures; and, support for the revision of the mining and hydrocarbons codes towards fairer contracts that profit the investor and generates significant resources for the state. The International Conference on Emergence in Africa being held under the theme: "Emergence, Private Sector and Inclusiveness" aims to deepen the debate on the robustness of growth and inclusiveness across the continent in Africa's emergence plans.